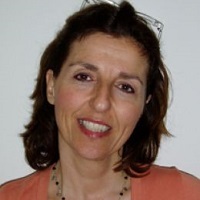 Ros qualified initially as a Speech and Language Therapist (SLT) at Reading University, achieved her MSc in Human Communication at the University of London, and completed her PhD at City, University of London. She has worked clinically with Deaf clients of all ages and currently works part-time at City, teaching, carrying out research and running the Sign Language & Reading Assessment Clinic. Ros lectures to trainee and post-qualification SLTs and has a longstanding interest in the clinical skills of SLTs who work with Deaf people. Her teaching and research interests are language development in British Sign Language (BSL) and communication and reading skills in deaf people. Ros runs regular training courses on the BSL Production Test as well as providing lectures and workshops to Teachers of the Deaf, Communication Support Workers and SLT Special Interest Groups. Since 2002, Ros has run a Sign Language Assessment outreach service based at the Language & Communication Science Division's on-site clinic, the Compass Centre, offering clinical assessments of Deaf children and adults' communication in BSL, based on Ros' research on language acquisition and assessment in deaf children. Ros' research interests focus on language development in British Sign Language (BSL) and communication and reading in deaf people. Ros has worked actively to highlight the lack of assessment materials for Deaf children who are BSL users and led the development of two major language assessments in BSL (BSL Receptive Skills Test, Herman et al., 1999; BSL Production Test, Herman et al., 2004). The tests are the only norm-referenced tests of any sign language in the world and both have since been translated into other sign languages. Ros also played an active role in developing the UK National Monitoring Protocol for Deaf Infants &; Children (DfES 2004). Ros is a research affiliate of the Deafness, Cognition & Language Research Centre at UCL (DCAL) and has collaborated with colleagues there on projects to develop BSL norms for the MacArthur Communicative Development Inventory and to characterise language impairment in BSL. Ros has been involved in projects to evaluate communication interventions with deaf children and is currently leading a major funded project to investigate reading and dyslexia in deaf children. - 2012-14: Reading and dyslexia in deaf children: the special case of children who sign (Nuffield Foundation). - 2010-12: Reading and Dyslexia in Oral Deaf Children (Nuffield Foundation). Herman, R. and Roy, P.J. (2016). Deafness and dyslexia. In Marschark, M. and Spencer, P.E. (Eds. ), The Oxford Handbook of Deaf Studies in Language (pp. 344–356). New York: Oxford University Press. ISBN 978-0-19-024141-4. Herman, R., Rowley, K., Marshall, C., Mason, K., Atkinson, J., Woll, B. … Morgan, G. (2014). Profiling SLI in deaf children who are sign language users. Multilingual Aspects of Signed Language Communication and Disorder (pp. 45–69). ISBN 978-1-78309-130-0. Herman, R.C. and Morgan, G. (2010). Deafness, language & communication. In Botting, N. and Hilari, K. (Eds. ), The Impact of Communication Disability Across the Lifespan London, England: J & R Press. ISBN 978-1-907826-03-0. Woll, B. and Herman, R. (2003). Using a standardised test of sign language development to examine the effects of input in the acquisition of British sign language. Pantelemidou, V., Herman, R. and Thomas, J. (2003). Efficacy of speech intervention using electropalatography with a cochlear implant user. Hoskin, J. and Herman, R. (2001). The communication, speech and gesture of a group of hearing-impaired children. Herman, R., E. Kyle, F. and Roy, P. (2019). Literacy and Phonological Skills in Oral Deaf Children and Hearing Children With a History of Dyslexia. Reading Research Quarterly. doi:10.1002/rrq.244 . Oktapoti, M., Okalidou, A., Kyriafinis, G., Petinou, K., Vital, V. and Herman, R. (2016). Investigating Use of a Parent Report Tool to Measure Vocabulary Development in Deaf Greek-speaking Children with Cochlear Implants. Deafness and Education International, 18(1), pp. 3–12. doi:10.1179/1557069X15Y.0000000008 . Roy, P., Shergold, Z., Kyle, F.E. and Herman, R. (2015). Spelling in oral deaf and hearing dyslexic children: A comparison of phonologically plausible errors. Research in Developmental Disabilities, 36, pp. 277–290. doi:10.1016/j.ridd.2014.10.012 . Herman, R., Ford, K., Thomas, J., Oyebade, N., Bennett, D. and Dodd, B. (2015). Evaluation of core vocabulary therapy for deaf children: Four treatment case studies. Child Language Teaching and Therapy, 31(2), pp. 221–235. doi:10.1177/0265659014561875 . Haug, T., Herman, R. and Woll, B. (2015). Constructing an online test framework, using the example of a sign language receptive skills test. Deafness and Education International, 17(1), pp. 3–7. doi:10.1179/1557069X14Y.0000000035 . Rees, R., Mahon, M., Herman, R., Newton, C., Craig, G. and Marriage, J. (2015). Communication interventions for families of pre-school deaf children in the UK. Deafness and Education International, 17(2), pp. 88–100. doi:10.1179/1557069X14Y.0000000043 . Herman, R., Rowley, K., Mason, K. and Morgan, G. (2014). Deficits in narrative abilities in child British Sign Language users with specific language impairment. International Journal of Language and Communication Disorders, 49(3), pp. 343–353. doi:10.1111/1460-6984.12078 . Marshall, C., Mason, K., Rowley, K., Herman, R., Atkinson, J., Woll, B. … Morgan, G. (2014). Sentence Repetition in Deaf Children with Specific Language Impairment in British Sign Language. Language Learning and Development. doi:10.1080/15475441.2014.917557 . Marshall, C.R., Rowley, K., Mason, K., Herman, R. and Morgan, G. (2013). Lexical organization in deaf children who use British Sign Language: Evidence from a semantic fluency task. Journal of Child Language, 40(1), pp. 193–220. doi:10.1017/S0305000912000116 . Herman, R.C., Roy, P. and Kyle, F. (2013). Dyslexia and deaf children. British Association of Teachers of the Deaf Newsletter. Herman, R.C., Shergold, Z., Roy, P. and Herman, R. (2012). Deafness in a hearing workplace. Bulletin of the Royal College of Speech & Language Therapists, (March 2012), pp. 12–14. Herman, R.C., Herman, R. and Thomas, J. (2012). From communication to language. British Association of Teachers of the Deaf, (March 2012), pp. 6–7. Herman, R.C., Alton, S. and Pring, T. (2011). Developing communication skills in deaf primary school pupils: Introducing and evaluating the smiLE approach. Child Language Teaching and Therapy, 27(3), pp. 255–267. doi:10.1177/0265659010381695 . Enns, C.J. and Herman, R.C. (2011). Adapting the Assessing British Sign Language Development: Receptive Skills Test into American sign language. Journal of Deaf Studies and Deaf Education, 16(3), pp. 362–374. Mason, K., Rowley, K., Marshall, C.R., Atkinson, J.R., Herman, R., Woll, B. … Morgan, G. (2010). Identifying specific language impairment in deaf children acquiring British Sign Language: implications for theory and practice. Br J Dev Psychol, 28(Pt 1), pp. 33–49. Mason, K., Rowley, K., Marshall, C.R., Atkinson, J.R., Herman, R.C., Woll, B. … Morgan, G. (2010). Identifying SLI in deaf children acquiring British Sign Language: Implications for theory and practice. British Journal of Developmental Psychology, 28, pp. 33–49. Herman, R.C., Herman, R. and Mann, W. (2010). Sign language assessment: Where are we now? British Association of Teachers of the Deaf, (January 2010), pp. 22–23. Herman, R.C., Woolfe, T., Roy, P. and Woll, B. (2009). Early vocabulary development in deaf native signers: a British Sign Language adaptation of the communicative development inventories. Journal of Child Psychology and Psychiatry, 51(3), pp. 322–331. doi:10.1111/j.1469-7610.2009.02151.x . Morgan, G., Herman, R., Barriere, I. and Woll, B. (2008). The onset and mastery of spatial language in children acquiring British Sign Language. COGNITIVE DEVELOPMENT, 23(1), pp. 1–19. doi:10.1016/j.cogdev.2007.09.003 . Herman, R. (2008). The world of deaf infants: A longitudinal study. INFANT AND CHILD DEVELOPMENT, 17(1), pp. 87–88. doi:10.1002/icd.489 . Morgan, G., Herman, R.C., Barriere, I. and Woll, B. (2008). The onset and mastery of spatial language in children acquiring British Sign Language. Cognitive Development, 23, pp. 1–19. Martin, K.L., Hirson, A., Herman, R., Thomas, J. and Pring, T. (2007). The efficacy of speech intervention using electropalatography with an 18-year-old deaf client: A single case study. Advances in Speech Language Pathology, 9(1), pp. 46–56. doi:10.1080/14417040601120912 . Morgan, G., Herman, R. and Woll, B. (2007). Language impairments in sign language: breakthroughs and puzzles. INTERNATIONAL JOURNAL OF LANGUAGE & COMMUNICATION DISORDERS, 42(1), pp. 97–105. doi:10.1080/13682820600783178 . Martin, K., Hirson, A., Herman, R.C., Thomas, J. and Pring, T. (2007). The efficacy of speech intervention using electopalatography with an 18 year old deaf client: A single case study. Advances in Speech-Language Pathology, 9(1), pp. 46–56. doi:10.1080/14417040601120912 . Koutsoubou, M., Herman, R.C. and Woll, B. (2007). Does language input matter in bilingual writing? Translation versus direct composition in Deaf school student's written stories. International Journal of Bilingual Education and Bilingualism, 10, pp. 127–151. Herman, R.C. and Roy, P. (2006). Evidence from the wider use of the BSL Receptive Skills Test. Deafness and Education International, 8(1), pp. 33–47. doi:10.1002/dei.33 . Morgan, G., Herman, R. and Woll, B. (2002). The development of complex verb constructions in British Sign Language. J Child Lang, 29(3), pp. 655–675. Herman, R. (1998). The need for an assessment of deaf children's signing skills. DEAFNESS AND EDUCATION, 22(3), pp. 3–8. Herman, R. (1990). How do deaf speakers talk about time?? Clinical Linguistics and Phonetics, 4(3), pp. 197–207. doi:10.3109/02699209008985482 . Herman, R.C., Roy, P. and Kyle, F. (2017). Reading and Dyslexia in Deaf Children. London. Herman, R.C., Roy, P. and Kyle, F. (2014). Reading, Dyslexia and Oral Deaf Children: From Research to Practice. London, UK: City University London. Reviewer for various academic journals, Reviewer. Herman R, Roy P & Kyle F. Literacy and dyslexia in oral deaf children. Reading (2013). Herman R, Roy P & Kyle F. Phonological skills, reading and dyslexia in oral deaf children. Seattle (2013). Herman R, Roy P & Kyle F. Literacy and phonological skills in oral deaf children. Hong Kong (2013). Herman R, Knight R, Parsons C & Rockrell N. Speech intervention using ultrasound technology with 2 deaf adolescents. Cork (2012). Marshall C, Mason K, Rowley K, Herman R, Atkinson J, Woll B & Morgan G. Investigating specific language impairment in deaf children who use British Sign Language. Edinburgh (2012). Marshall C, Mason K, Rowley K, Herman R & Morgan G. Sentence repetition as a proxy for language development and impairment: Insights from deaf signers. Thessaloniki, Greece (2011). Oktapoti, M., Herman, R., Okalidou, A., Kyriafinis, G. & Vital, V. Vocabulary skills of cochlear-implanted Greek children. Athens, Greece (2011).